Brother Martin's takes third Division I title in succession; Jesuit places second in Division I; Teurlings Catholic nips Live Oak for the Division II championship; Brusly sets a record in claiming the Division III championship while De la Salle takes the runner-up spot. OWs: Division I - Connor Stampley of Comeaux (126 lbs. ); Division II - Sterling Saylor of Plaquemine (132 lbs. ); Division III - Trevor Schermer of Brusly (152 lbs.) along with his 4th Division III championship. 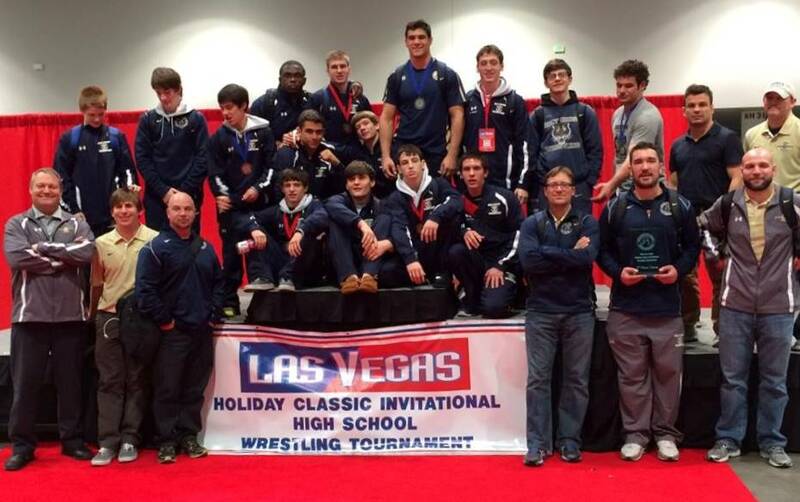 Notifications re new pieces published on the Louisiana Wrestling News Website are available via Facebook. Click HERE to see the LWN FB page and hit "Like" if you would like to receive notifications when they are posted. Clicking the "Like" button on the Website itself is appreciated but does not serve the same purpose. Only notifications of additions to the Louisiana Wrestling News and the Louisiana High School Wrestling Archives Websites are posted on the LWN Facebook page. Editor; Contributors: Rip Rittell, Shannon Hill, Camille Tyra, Bobby Hebert, Guy Patron, Sr.
"CONTRIBUTOR(S) citation of February 22nd? Nicole Robichaux of Destrehan. Division I vs. Division II: Klein (BM) and Hill (LO) at the Spartan Open. Yehia Riles (BM) and Daniel Relayson (HC) at the Spartan Open. Cody Hill shoots a takedown on Tristan Lee of Teurlings Catholic. Brice Duhe of Holy Cross scores a fall over Brother Martin's Travis Quarterman in the Spartan Open finals. Alex Betteridge (L: in blue) and Cody Hill (R: in blue) will be competing for the first time in lower weight classes (106 lbs. & 126 lbs. 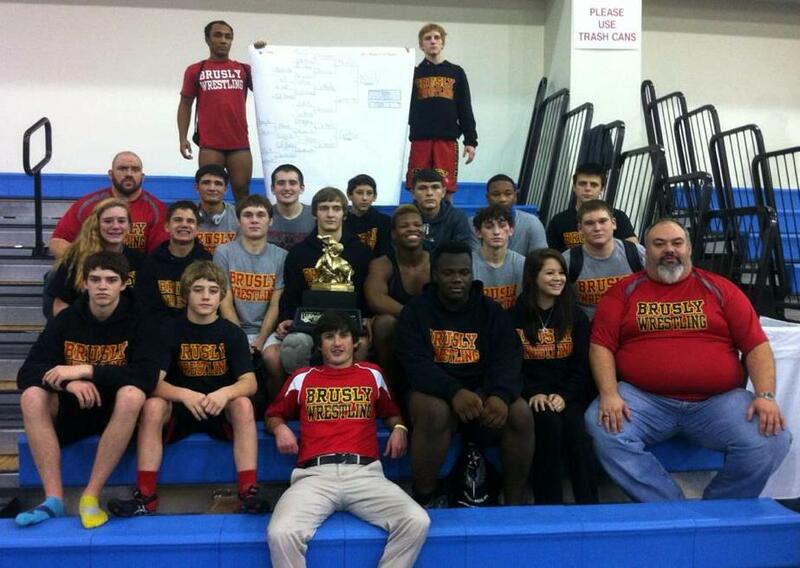 respectively) at the Bayou Duals this weekend. Jesuit JV takes 2nd @ Zachary "Big Horse"
St. Amant wins Zachary "Big Horse"
(L-R) Comeaux's Nicholas Malveaux (3rd), Hunter Fitch (1st), Connor Stampley (1st) and Jacques Girouard at the Zachary "Big Horse" Open. Bumgarden at Jeff. Inv. Guy Patron, Jr. and Porter Dazet at the Raider Open. Raider Open OW Rick Lacava. Jefferson Invitational OW Nick Lirette. 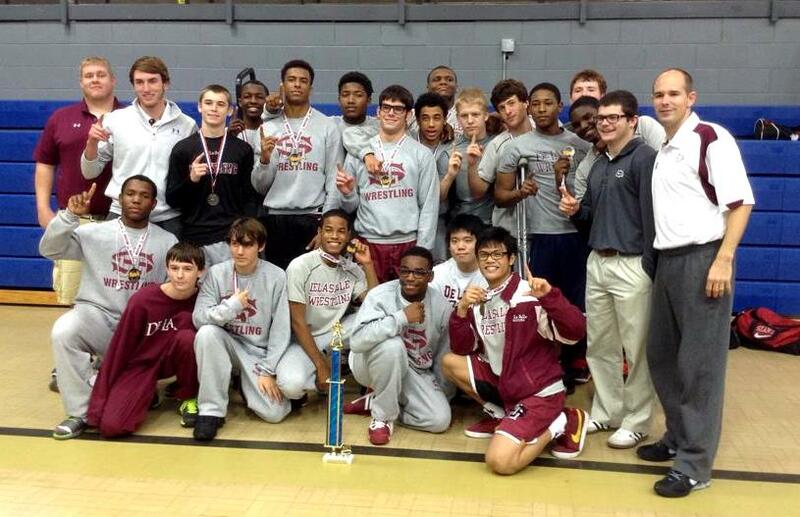 A last minute entry, the Brother Martin Crusaders dominated the Trygg Memorial tournament, winning 11 championships en route to a 184 point margin of victory over runner-up Pearl River. Joey Foret of Holy Cross scores nearfall points on Brother Martin's Seth Gambill at the Mandeville Open Brother Martin's Travis Quarterman scores a fall over Mandeville's Bailey Dufrene at Mandeville Dylan Soileau of Holy Cross switches against Rummel's Tyler Mire at the Mandeville Open. Trevor Schermer of Brusly against Clay High School (FL) opponent Adam Breindel at East Ascension's Conor Karwath rides Brusly's Jo'Vonte Wheeler in the finals of the South Walton "Border Wars." Brusly's Kendon Lee-Keyser is fitted with the Outstanding Wrestler belt by coach Rodney Sutherland at the South Walton "Border Wars." Noah Landry is congratulated by the coaches of The Villages High School after his finals win at 138 lbs. at the South Walton "Border Wars." Holy Cross' George Benoit did all he could to takedown Brother Martin's Austin Meyn, but it was Meyn who scored the only takedown and earned the victory. Denham Springs' Shelby Elsworth (top) vs. Dutchtown's Dylan Primes. Elsworth, the Yellow Jackets' only entrant, placed 3rd at 145 lbs. 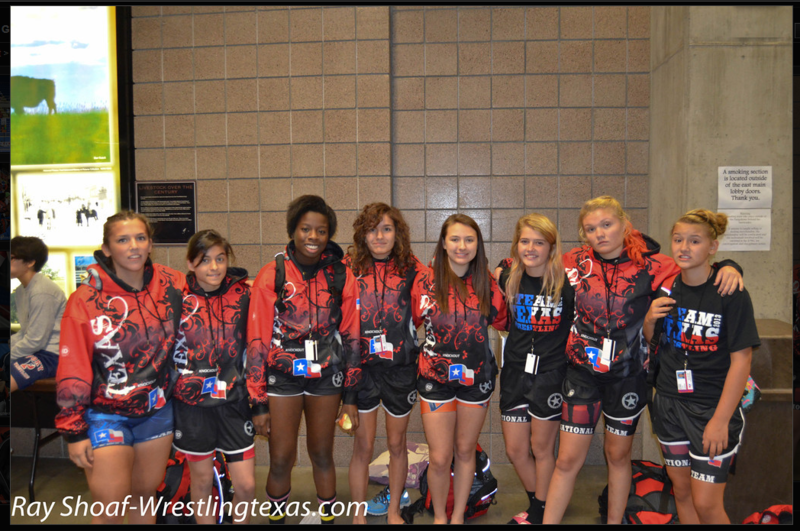 Doyline upcoming sophomore Brittany Bates (4th from left), wrestling with Team Texas, placed fourth at the 2013 USAW Cadet Women Freestyle National Championships in Fargo, ND on July 13th. Holy Cross' Travis Gardner (6th at Cadet 285 lbs., Chris Zea (5th at Junior 100 lbs.) and Brice Duhe (8th @ Cadet 160 lbs.) 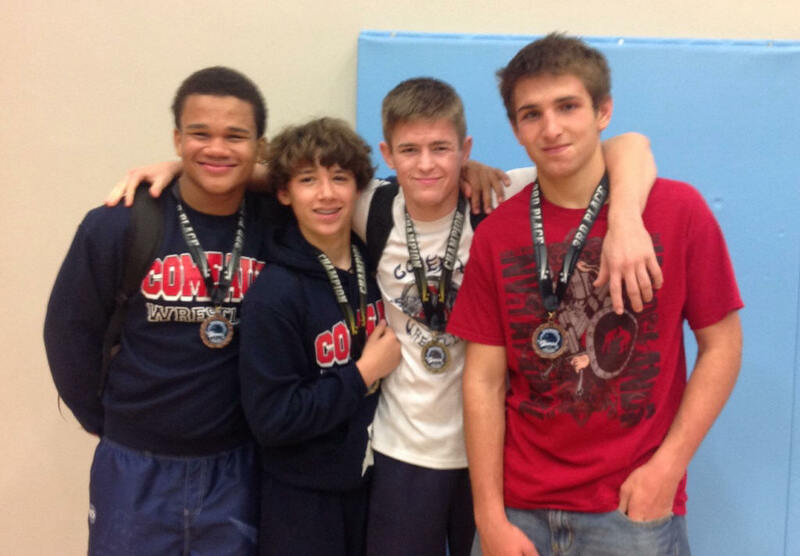 at the USAW/CK Folkstyle National in April. 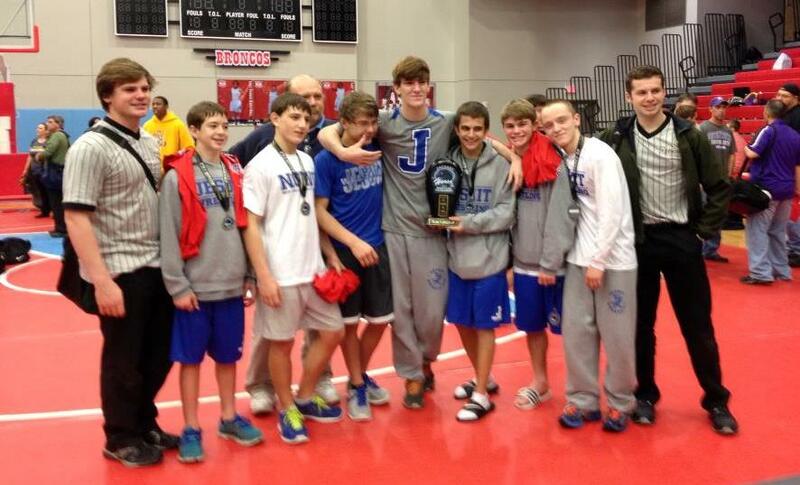 Jesuit's Nicky Charles (8th at Junior 106 lbs.) and Brody Martin 4th @ Junior 100 lbs.) at the USAW/CK Folkstyle National in April. Jeffrey Kirkland (green) of the Westbank W. C. performs a standing Granby vs. Raymond Bushnell of BRAWL at the Jazz Town Duals. The Granby netted two points, but Bushnell prevailed 6-4.